Imagine your loyal, beloved dog kidnapped, trucked long-distance in a cramped wire cage, then butchered for meat in a filthy market stall. This may sound like a horror movie, but the corpses of stolen pets are on full display at the Yulin Dog Meat Festival in China each June. And the dogs need your help to stop the slaughter. An estimated 10 million dogs are consumed for food each year in China, and 10,000 dogs are scheduled to die at the Yulin Dog Meat Festival alone. These include stolen pets, strays, and commercially raised dogs. The reason for this festival of horrors? A centuries-old tradition to celebrate the summer solstice with dog meat. Not in the LA area? Don’t worry – you can help by simply mailing a letter to the Chinese Embassy. The Chinese government is known to block emails, but postal letters can still get the message through. I demand that the Guangxi YuLin government put an end to the Yulin Dog Meat Festival. I have great respect for the Chinese people and Chinese civilization, but I am horrified to learn that the brutal event still exists in a modern civilized society. 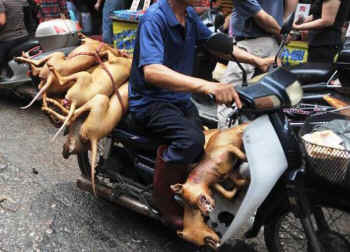 The Yulin Dog Meat Festival is internationally perceived as a disgrace to China. I adamantly state my strong opposition to this gruesome practice. I also urge that your office work with China’s Department of Agriculture in passing an animal protection law that bans the dog and cat meat trade. With your help, we can save tens of thousands of innocent dogs from brutal torture and death. Act now to help these animals, who cannot help themselves.